On Monday 9 May 2016, a Mercury transit across the face of the Sun took place. During a transit, Mercury is seen as a small black dot moving very slowly in an East-to-West direction across the Sun. The 2016 Mercury transit began on 9 May 2016 at 11:12 UTC and ended later that day at 18:42 UTC. Mid-transit took place at 14:57 UTC. This photo was taken in Belgium, less than 30 minutes after mid-transit. Even though a transit of a planet across the face of the Sun is a relatively rare event, this Mercury transit could be observed from many populated places on Earth such as Western Europe, Eastern North America and Northern South America. 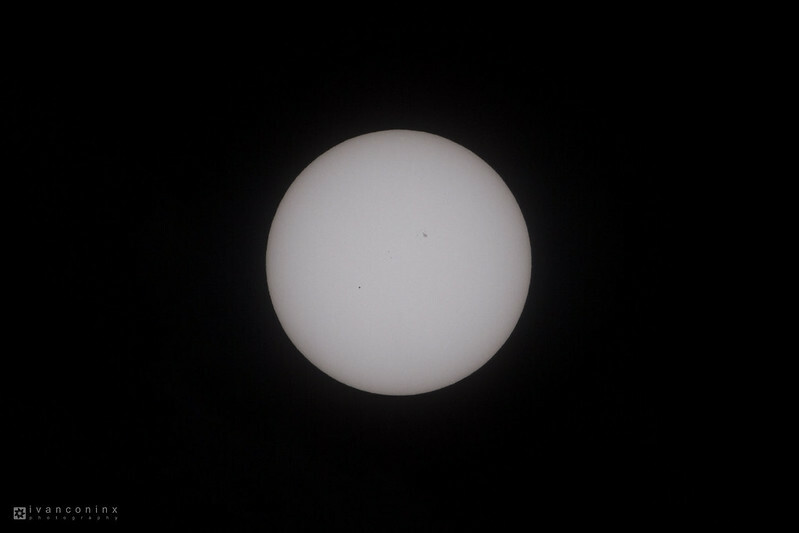 For this photo I used a Mylar filter, designed for solar observing. Mercury is clearly visible as a small black dot. Also visible in this picture is NOAA AR (Active Region) 12542, an active group of sunspots. Finally, the other, smaller group of sunsports is NOAA AR (Active Region) 12543. The next two Mercury transits will take place on on 11 November 2019 and 13 November 2032. This entry was posted in Astronomy and tagged Astronomy, Astrophotography, Mercury, Sun, Transit.